Lava Rock is a lightweight decorative rock popular in today’s natural landscapes seeking low maintenance. The vibrant colors complement and help contrast landscaping elements such as shrubs, grasses and flowers. Being lightweight, Lava Rock is easy to apply. It’s durability offers a lasting alternative to beauty bark yet Lava Rock can help maintain soil humidity without attracting insects. Lava Rock was “created in Nature’s own furnace . . . spewed forth in a magnificent display of red boulders, sand and gravel deep within the earth. 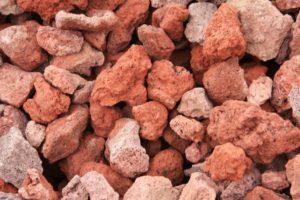 This rare product comes to us in a way that man has not been able to duplicate.” According to mineralogists at Oregon State University, Lava Rock resulted when steam rose through a volcanic cinder pit after an eruption. Enough silica dissolved in it to deposit opal on the surface of large bubbles that formed before the cinders solidified. Non-precious opal is made of silica, oxygen and water. The ovaline formed before the eruption and is surrounded by the later forming cinder material – the opposite of opal. Driveway gravel, landscape rock, decorative are just a few examples of uses for lava rock.